Now a soloist, MICHAEL SWEET spoke to Andre Verschoor and Jan Willem Vink. Only memories are left for Michael Sweet. His four gold and two platinum records, his striped guitars and the leather outfits and other kitsch that reminded him of his 10 Stryper years are all gone. A burglary removed them from sight. Stryper were a record industry phenomenon. Their satin outfits and makeup may have made staid evangelicals squirm but the band's intriguing fusion of glam rock and heavy metal brought them a stream of gold and platinum discs. Their exploits were legendary, throwing Bibles to stadia of air punching followers, taking every opportunity to share their faith. But then the wheels started to come off. Stryper's album 'Against The Law', with a new image and without the in-your-face Christian lyrics, wasn't the breakthrough record it was supposed to be. No promotion for the album simply meant no success and only poorly visited concerts. The big arenas Stryper played during their To Hell With The Devil' days were replaced by small clubs, which only led to bigger dissatisfaction for the band. The band extended its rebellious image, but that didn't help Stryper any further. From that moment on Stryper was a sinking ship. 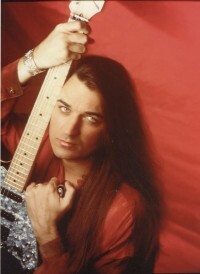 Singer/guitarist Michael Sweet was the first one to leave. There followed a lengthy period of revaluation both musical and spiritual. Now one of the most distinctive voices in rock music is heard anew, with Michael embarking on a solo career with the release of the 'Michael Sweet' album on Benson. It's already getting rave reviews and big US Christian radio airplay. We began by asking why 'Against The Law' had flopped. "The big difference between 'Against The Law' and the older albums was a change in attitude. We were still Christians but we wanted to come across like rebels, we were angry. I don't know whether everyone else saw the band that way but in fact that's the bottom line. Our music became more raw and our lyrics weren't as sweet as they used to be. We were tired of Christians coming up to us and trying to destroy us through all the confusion they were spreading. The album 'Against The Law' and specifically the title track were directed towards them. "A lot of people thought 'Against The Law' was a better album," said Michael. "But there were simply more people preferring the old material. We sold 1,500,000 copies of 'To Hell With The Devil'. We played for 10,000 people an evening, so I think more people appreciated that kind of stuff. Those people did not understand our direction with 'Against The Law' and we lost lots of fans. Our lyrics changed, our outfit changed and for a lot of people we changed from good boys to bad boys. My heart wasn't where it should have been. I feel now we weren't serving like we did in the beginning. It was a very empty feeling. You need to totally sell out to God to let him use you. It has to be a 100 per cent commitment. "That was the moment everything seemed to be going wrong and that's why I ultimately left the band. Though there isn't one certain reason I left. If I had to make a list of reasons to leave Stryper, it would be a long one. The most important thing, however, is that I felt my task within Stryper was fulfilled and it was time to go on. I'd been a member of Stryper for 10 years but I got the feeling God was trying to get me out of it. Stryper has had it's time, God used it in an incredible way, but everything comes to an end. At the moment I left Stryper, I entered a new direction, a new ministry. I didn't leave because of any arguments or fights within the band, or a lack of agreement. 'It' just didn't happen anymore and I felt I did not have any musical challenges any more. Now that I've entered a new road I feel young and fresh again. I like many different types of music. I wanted the chance to express another side of me." The difference between 'Against The Law' and Michael's debut is obvious. Were the musical differences in the band that big? "There weren't real big differences between Tim, Oz, Robert and me. Not in a lyrical way. On a musical level, some differences had grown, especially between Oz and me. It did not lead to any fights, because I can say that within the band Oz and me were closest to each other. But certainly when the band was coming to a close I felt I wanted to enter a new musical direction and I knew Oz wouldn't be happy with that. I remember talks from that time and he was always talking about Guns And Roses. That was where the band and Oz were willing to go and it was something I didn't want. It's not what I feel good about. I have never been willing, and I will never be like Guns And Roses." Robert Sweet did everything to keep Stryper alive. Rumours were spreading around Dale Thompson of Bride would take Michael's place. Was Robert ever angry at Michael for leaving Stryper? "I honestly don't know, he's never told me anyway. I don't know that's what he thinks. I don't think so...," Michael thought aloud. "I don't think it's my fault Stryper came to an end. The band was already falling apart. We had no record contract; we played in small clubs instead of big arenas. I don't think my solo career has anything to do with the end of Stryper. I left a sinking ship." 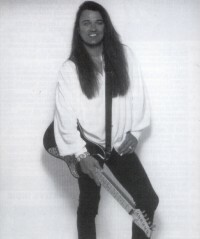 After leaving Stryper Michael started recording demos with Tony Palacios from Guardian. "It was a real rocking demo, like 'Against The Law'. Nobody has ever heard it. It was real heavy. Maybe I will even record those songs. After leaving Stryper I wrote 16 songs and made three demos. After that I deliberately quit for a while. I wanted to rest and spend time with my family. I enjoyed the time spent with my wife and children. I enjoyed having a normal life for a change, being involved in my son's soccer games, going to my home church on Sundays, things you don't do when you are recording and touring all the time. "In the meantime I signed with Benson and my album will be released in March. I'm getting more and more excited now that moment is approaching. I missed my music. I have so many songs in my head that I was dying to record. I really missed being in the studio and creating music. I think the old Stryper fans, especially those who loved 'Against The Law', will be somewhat disappointed. It's not as hard. But this is exactly what I wanted. I'm not going to have any of the glitz of Stryper. I'm gonna be more street... no costumes or anything. It's basically gonna be me and my guitar going out there and letting the songs do the talking. In terms of ministry I want what I've always wanted - to offer positive messages to people -especially kids and teenagers. There don't seem to be any lines drawn in entertainment anymore. Kids are really getting hurt by a lot of what the media is feeding them. But I still think they are reachable with something positive." The buzz about the 'Michael Sweet' album is considerable. The publicity blurb swoons, "The album ranges from heart-rending ballads to rousing arena-rock anthems, as Michael lends his irresistibly catchy pop/rock to powerful songs of love for the Lord, his wife and fellow men." "Musically, I would call what I'm doing now 'power pop'," commented Sweet. "It definitely rocks, but it's not metal. It's going to cross over boundaries and hit a lot of people." Michael's lyrics are definitely more overt than the final Stryper material. Each of the songs has biblical references on the lyric sheet. Michael observed, "I think these songs reflect certain feelings. For me there was a link between these songs and the Scriptural references. These references give the songs a direction as well. 'Take Me Home' is a song about where I've been in the last 10 years of my life. I had it all and threw it all away, now I'm calling on God to take me home again. I put everything at risk, and really was drifting for a couple of years. But he's always there to take his prodigals home. I just thank God that he's a God of second chances. "I have experienced God to be very forgiving in this past time. I myself have a son and a daughter. If they do something wrong I get angry. I don't think God gets angry when we do something wrong, but it hurts him. He feels pain. Just because he loves us. He loves all men on this earth the same and he sent his son to die for us. And we keep making mistakes and being disobedient. We don't learn from our mistakes. Sometimes I don't understand the fact that God loves me, but on the other side I'm so thankful that he loves me. I wouldn't know where I would be without him and what I would have to do if he wasn't there. That's a very scary thought I now realise. The thought that if God wasn't a forgiving God, where would we be?" During this period Michael's wife Kyle has been very important for him. "I didn't treat her too well during the final Stryper years," admitted Michael. "I've given her little time. I'm so thankful she kept believing in me and stayed with me, despite the fact that it has been very difficult for her. I was on the road with the guys. When she needed me I wasn't there. I wanted to be a rock star, with no responsibilities. I had a home, a wife and kids but I did not want to have the responsibilities those things demand. In that area I was a rebel as well. That always comes back when I think of 'Against The Law'. I wanted to be a rebellious teenager, which greatly threatened our marriage. But with all the changes it's better than it's ever been. I wrote 'Tomorrow, Tonight' for my wife. I ask her to forgive me, for the time I was difficult to live with, to not remember the past and to think tonight of tomorrow. To think together of a long and beautiful future. "My fondest hope is just to be accepted again," Michael continued. After the release of his debut he will tour extensively and visit all countries he's visited with Stryper. "Europe, Canada, Japan, Australia and you can go on like that. The tour will start in the US and then eventually hit Europe, although I have no specific dates yet. You can expect a high-energy show, and I have a great band. It has taken me two years to choose my players and they are just outstanding. Jamie Wollam (Guardian, 'Miracle Mile') on drums, Dennis Cameron (Angelica) on guitar and either Scott Harper (Whitecross) or Tracey Ferry (Seraiah) will play bass. Of course I will play guitar myself, but I love to be on stage without guitar as well! I want the music and the message to do the talking, not the hair and the makeup. There was too much focus on Stryper's 'look'. It is the message that matters." Stryper's Michael Sweet takes a playful shot at rock artists "going country"